Please help BASE Camp Children’s Cancer Foundation in any way that you can. Swim-A-Thon, Coin Canisters, Hat Day, Dress Down Day, Sam’s Club Foundation, sell your stuff on eBay… Want more info? Want to pitch in? Talk to Terri. Here is a list of some of our Fundraising Opportunities. Miles For Smiles – Walk, run, skip, bike, climb, swim, or in-line skate to raise money for BASE Camp Milestone Parties. Celebrity Waiter Luncheon – Host a wild, crazy, and unique luncheon that will be the talk of the town. Hat Day, or “Dress Down Day” – Honor children on chemo. Everyone in the office who makes a donation to BASE Camp can wear a hat to school or work, or wear casual clothes to work. Fun hats make smiles. Be the coordinator of your office or school! Cents for Kids – Coin canister collection. Find fruitful locations for folks to drop their spare change. Every penny counts. Poker Run – Join the Osceola Riders on a motorcycle ride to benefit BASE Camp. 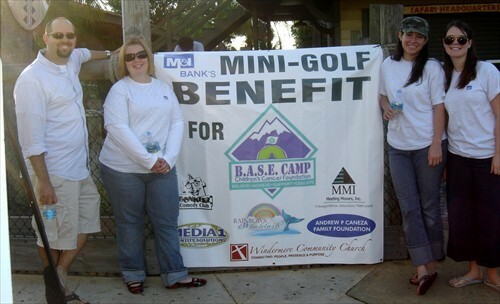 Golf Event – Organize or participate in a fund-raising golf event. Sam’s Club Foundation – Hold a fund-raiser at Sam’s Club for BASE Camp. After approval for fund-raising, the SAM’S CLUB Foundation will match up to $1,000 of the funds raised at the SAM’S CLUB location. Sell your stuff on eBay – Designate BASE Camp to receive all or part of the revenue from your sales on eBay. Grant Writer’s– Are you good with words, and research? Help us finds funds, writes concept letters, and compose grant proposals. Tupperware– Order and have an online party or a fund raiser!